At a rousing faith-based rally Tuesday night, four Lakeland city commissioners pledged to reach a goal of adding 500 housing units for families with homeless children by 2023. Mayor Bill Mutz and commissioners Stephanie Madden, Justin Troller and Phillip Walker drew cheers for their pledges from the approximately 1,400 participants at the 19th annual Nehemiah Action rally of the Polk Ecumenical Action Council for Empowerment, or PEACE, at Resurrection Catholic Church in Lakeland. 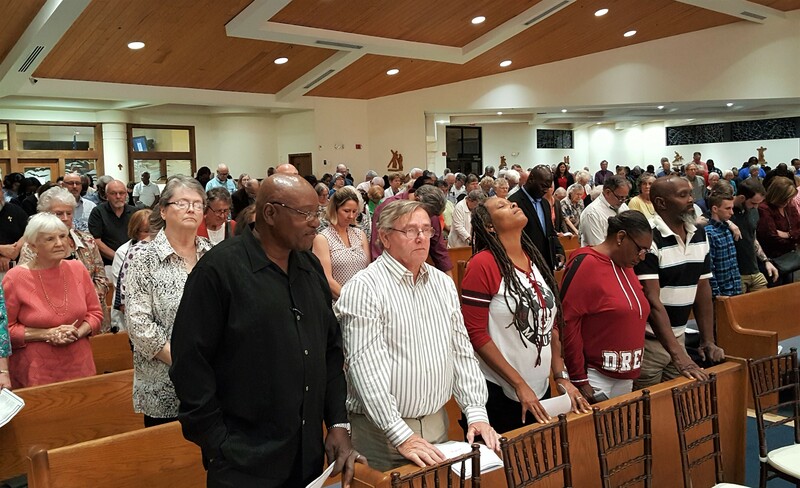 PEACE, an interdenominational and interracial organization composed of 18 congregations in Polk County, including 12 in Lakeland, each year identifies community problems and pressures local officials to support proposed solutions. This year’s rally focused on two issues – homelessness among Polk County students and the lack of mental health care. According to a report presented at the rally, approximately 4,000 Polk County students – or 1 of every 22 – are homeless, most of them living in motels or staying with relatives or friends. The Rev. Ben Turner, pastor of Strong Tower Church in Lakeland, said children who are homeless are more than twice as likely to be absent, to perform poorly in school and to present behavior problems. “The waiting list for subsidized housing in Lakeland has been closed for years. In Polk County, 40,000 families are paying more than half their income on housing,” he said. The rally heard emotional testimony from Tatyana Alexander, an 8th-grader at Jewett School of the Arts in Winter Haven who said when she was 9 her family became homeless because health problems cost her mother her job. She recounted how the family had to stay in a hotel, in the family car and with relatives. “I just want to tell you the situation because, like, there are other kids like me who are frustrated and can’t really do anything,” she said, sobbing. Redirecting the focus of Community Development Block Grant and HOME Investment Partnerships Program funds from rehabilitation of existing homes to the creation of new affordable housing units. Establishing a cross-departmental task force to address affordable housing and allocating funds to offset development costs. Modifying the tax-increment financing program to provide graduated payments within Community Redevelopment Areas where developers include affordable housing. PEACE wanted Mutz to commit to advocating that the recommendations be adopted into the city’s one-year action plan and brought to the City Commission for a vote by June 30. Mutz agreed to the demand “in principle,” but he balked at the timeline, saying that Sept. 30 is a more realistic date. He did agree to schedule a commission workshop before June 30 to focus on housing problems for homeless schoolchildren. Lakeland Mayor Bill Mutz, left, and Polk County School Board member Billy Townsend talk after Tuesday’s PEACE rally at Resurrection Catholic Church. “Regardless, we do need 500 housing units. The tone (of the demand) is stronger than I would have preferred, but I understand the intent,” he said. Madden, Troller and Walker unequivocally agreed to support recommendations of the city staff. However, Commissioner Scott Franklin, while acknowledging the housing problem, declined to give his support, saying he had not seen the recommendations. New Commissioner Sara Roberts McCarley attended the event but was not called on to give her position. Commissioner Bill Read did not attend. Mayor Brad Dantzler and City Commissioner Nathaniel Birdsong, Jr., of Winter Haven made similar pledges to work toward adding 150 housing units in that city. PEACE had less success on the mental health issue. Only one Polk County commissioner, Martha Santiago, appeared at the rally. PEACE wants the County Commission to use funds from $36 million in reserves, designated for five health-care clinics for the poor, to hire counselors and a staff psychiatrist to provide mental health services at those clinics. One of the clinics is located in Lakeland. Santiago agreed to work with PEACE to develop a plan to increase access to mental health care, although she did not agree to direct the county staff to develop a proposal by July, saying there was not enough time. PEACE leaders also delivered a progress report at the rally on an earlier issue taken up by the organization, diverting teens arrested for misdemeanors into a program that avoids an arrest record. In 2017, PEACE persuaded the State Attorney’s Office and most law enforcement agencies in the county to agree to refer teens sent to the Juvenile Assessment Center to Teen Court, where their cases can be adjudicated without creating a permanent arrest record. No reason was given for the difference in the diversion rates among the agencies, but PEACE leaders applauded Lakeland Police Chief Ruben Garcia and Winter Haven Police Chief Charlie Bird, as well as Polk County Sheriff Grady Judd, who was not present.